Camden rentals are in a leafy borough with a rich literary history, a flourishing present and are a popular place to reside. Voted one of London’s best places to live, this area is a thriving spot. It is conveniently located between Central London and the calm area of North-West London. 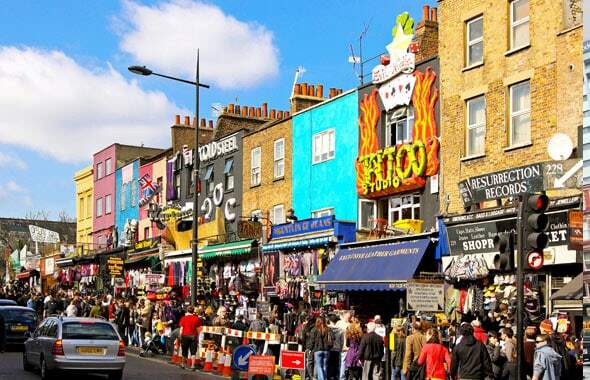 From the numerous restaurants, pubs, shops, and businesses, the Camden rentals market is a premium area. In addition, Camden Town is in the heart of the London Borough of Camden, which stretches from Islington in the east to Kilburn in the west and from Holborn in the south to Hampstead’s Whitestone Pond in the north. However, the east side of the Borough of Camden is somewhat less expensive than the west. Consequently, the east side usually houses the younger generations who work or go to school nearby. The West-end is mostly populated by the professional city workers, families, and even some celebrities. All walks of life call Camden rentals home, from expatriates and students to professionals, and literati types. Due to the ‘bohemian’ trend, that is particularly prevalent in these parts. Hence, this stems from a thriving local music scene, and numerous concerts held almost nightly. Camden rentals are a mix of every kind of property; from low-rise council blocks and small Victorian terraces. As well as Camden rentals that are four-story Georgian terraces or handsome Victorian houses that are converted into rentals. While Camden sits in an ideal location, it is still possible to find a bargain Camden rentals or flats in the area. The varied mix of options, from expensive townhouses to ex-social housing means that Camden offers much more space for your money than its neighboring areas. Want to know more about Camden Rentals? Camden, famously known for housing the Camden Market, the London Zoo, Regents Canal, and some of the best restaurants in London; truly has something to offer to everyone. York and Albany, run by the famous Gordon Ramsay group, is a well-loved spot to go for a glass of wine or exquisite original dish. The menu offers classic British cuisine along with an extensive wine list. On Tuesday evenings, live music is held accompanied by a bar snack menu; stone baked pizzas, truffle chips, and artisan bread. It’s no wonder this restaurant is a favorite local hotspot. Voted one of the best pubs in London, the Spread Eagle is a great local joint to come for a hearty meal and a cold brew. Serving up the likes of classic delectable British fare, this gastropub is a favored spot to come for ale and a filling meal after a hard days work. For an eclectic shopping experience, the Camden Stables Market is a buzzing place to find the treasure you’ve been after. Yet, it was once a hospital for injured horses during the Victorian period. While now it is the Stables Market, a shopping paradise full of antiques and unique items, from clothes to art and everything in-between. For a unique shopping experience, locals frequent the Lock Market. Here you’ll find everything from corsets and children’s clothing to Japanese tableware and multicultural food stalls situated along the canal. Known to be the best quirky shopping destinations in London, this market is a great place to browse, shop, eat, and mingle with people from all over the world. Most noteworthy is that Camden is an urban area, situated close to a few large green spaces. With Primrose Hill, boasting a breath-taking panoramic view of the city, it seems like the best view of London overall. Another green oasis is Regent’s Park, a spacious greenery being just minutes away. Furthermore, there is Hampstead Heath, a massive area of fields, ponds, woodland, and babbling brooks, being a mere 10-minute bus ride away. All are perfect spots to get some fresh air after a busy day in the city. Regent’s Park is one of London’s most attractive open spaces, covering 410 acres in northwest London. The enchanting Open Air Theater in the park hosts various popular food and music festivals. In addition, during the summer the locals from Camden rentals are known to flock to in the warmer months to attend the shows. Further, there are row boats for rent, band stands, tennis courts, and ice-cream stands. Also, there is a generous rose garden, playgrounds, and a delightful garden café. Regents Park is a well-loved spot to go for a lovely day out in the fresh air. With excellent local transport links all nearby, you have the Chalk Farm, Mornington Crescent and Kentish Town stations. As well as, the Camden Town station. The area is a hub for buses, and the footpaths of the Grand Union Canal are an excellent resource for cyclists.